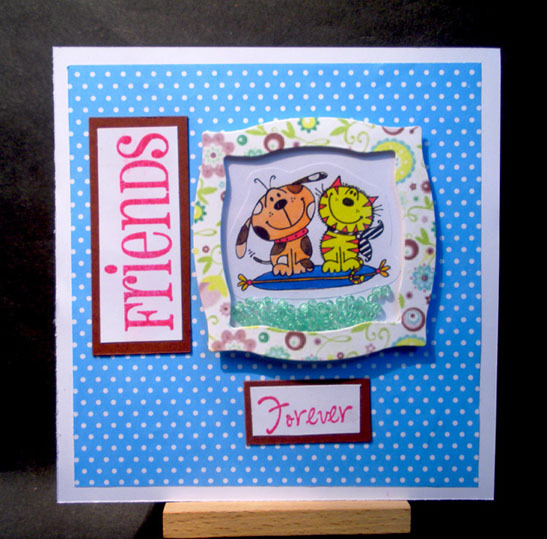 Penny Black Sticker 'Whiskers & Tails', Lifestyle Nesting Frame 8, C.C.Designs sentiment rubber stamp. Oooh this is so sweet. I just love that floral frame around your image and it really makes it pop. Thanks for joining our relaunch at ABC. What a bright and joyful card!! Thanks for playing along with us at ABC!!! Such a sweet, happy card! Thanks for joining our CropStop WCMD Challenge! What a cute card, love that happy image! Thanks for joining our Free for F'All challenge, good luck! This is so cute! I love the paper you used for the frame - so fun and festive! Thanks so much for joining our Beary Sweet Challenge - good luck!